On Saturday, November 12, Girls Can Do with the support of Microsoft Retail Stores will host over 2,000 young women and girls at the historic Warner Theater in downtown Washington, DC for a day of fun, education, inspiration, and “Possibility Thinking.” Answering the ever present need for strong, accomplished, and resilient female role-models, Girls Can Do seeks to empower young women and girls to think beyond their immediate reality by creating a spark of inspiration. This inspiration is transformed into action by connecting these girls with local organizations who provide year-round programming for girls – what Girls Can Do calls their Girl Partner Network. 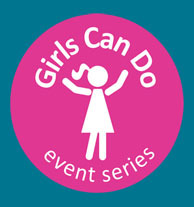 “The purpose of the Girls Can Do event series is to ignite a spark for what is possible in girls across the country and then around the world, so they can begin to see the potential that lives inside them,” said Karen Clark Cole, Founder and Executive Director of Girls Can Do. As well as the founder of Girls Can Do, Karen is the Co-Founder and CEO of a User Experience software consulting company, Blink UX, and is a contributing writer for Forbes.com. On November 12, First Lady Michelle Obama will open the day with a video welcome speech recorded especially for the event. Throughout the day there will be twelve, ten-minute Ted-talk style presentations by a diverse group of women leaders. Between each speaker, representative girls from some of our Girl Partner Network organizations will come on stage to share what their program offers. At each event we host 15-20 of these organizations and provide them with a table in the lobby for participants to learn more or sign-up. To access more girls nation-wide, Girls Can Do has partnered with Microsoft Retail Stores to live broadcast the event in ten of their stores across the country. In conjunction with hosting a viewing party and providing food, each Microsoft Store will conduct a fun-filled coding workshop for girls in attendance. At the live event, Girls Can Do will have students from DC and the surrounding areas from middle schools, high schools, colleges, and community programs. Specific schools and programs include: South East Washington, Anacostia High, Ballou High, Kramer Middle, G James Gholson Middle, Gallaudet University, Big Brothers Big Sisters, Community Bridges, Hillside Work Scholarship Connection, and Community of Hope. Krishanti Vignarajah: Policy Director for First Lady Michelle Obama. Lisa deWit: Department of National Defense, Senior Auditor, NW Coast Native American. Commander Rachel Lewis: Senior Service Advisor, US Coast Guard Personnel at the National Intelligence University. Linda Wagener, PhD: Human development specialist. Psychologist, film maker and founding Partner of Marigold Associates. Christy Hansen: Program Manager, NASA Airborne Science Campaign Operation IceBridge. Former space flight EVA trainer. Divinity Roxx: Solo Artist, Base player, rapper, and songwriter. Kalisha Dessources: Policy Advisor, White House Council on Women and Girls. Cristina Flores: Marketing and Engagement Manager, National Business Women’s Council. Angela Martin: Special Olympics gold medal athlete in downhill skiing and swimming. Natalie Hampton: Founder and App Designer of Sit With Us, anti-bullying lunchtime table sharing app. Victoria Indaco: Mechanical Engineer, Tesla Motors. Baja California race car designer, builder and driver. Diane Hansen: First Sergeant and Police Academy Instructor, Maryland State Police. Reetu Gupta: Engineer, Marketer, and Entrepreneur. Co-Founder and CEO of Cirkled-In, student knowledge sharing software platform. Girls enter to the music of teen DJ Ava Solomon, pickup nutritious snacks provided by Girls Can Do for free, and get settled for the event. Twelve, ten-minute inspirational presentations with videos, photographs, and stories. Between each talk there will be a three-minute activity based presentation hosted by local organizations, and a 15-minute intermission in the middle of the day. Food and beverages will be provided at the start and part way through the day at no cost to girls. Girls have an opportunity to get their questions answered with all the speakers on stage in a panel setting. Girls may line up at a microphone placed in the audience to ask questions of the speakers. After the panel, each speaker will be available for girls to come and meet them individually, take pictures, sign autographs, and ask more questions. For any additional questions, please reach out to Ragina Arrington, Community Partnership Director at Ragina@girls-can-do.org. The event will be open and welcome to the press.